Swine influenza also known as swine flu which is the cause due to influenza virus and it is released from the respiratory tract of pigs. The virus has the ability to change so that it is easily spread to people. In humans, cough, fatigue, nasal catarrh, vomiting, fever, diarrhea, body aches, etc. are the symptoms. In Ayurveda, it is known as cough fever which occurs due to imbalance of air and water. It enters from the air in the body and creates symptoms of cough, catarrh and body aches. We tell you such ways so you can deal with the flu virus and swine flu too. You do not have to do all things together. You can choose some of these drugs that are suit you. 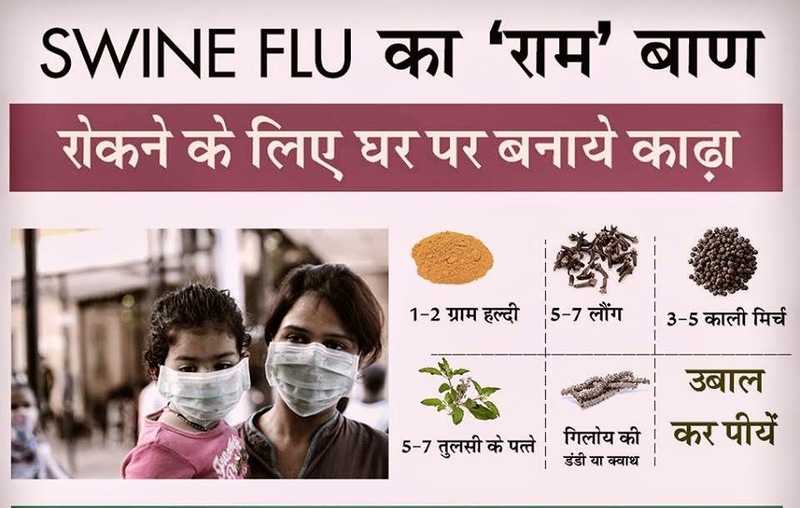 If you are suffering from swine flu then it is helpful to you. Basil leaves: Take basil leaves which are washed on both sides in morning. Basil has its own therapeutic properties. It keeps the throat; lungs clean and prevent infection and increase immunity. Giloy: Normally Giloy found in many areas. Take long branch of Giloy and add 5-6 basil leaves and boil them for 15-20 minutes until it dissolves in it right to the element. Add black peeper, rock salt or black salt and sugar. Take it to cool and take it warm. It is effective for immunity. If the Giloy plant is not available then you can take any other brand of compassionate or Giloy powder. Camphor: You can take bullet-shaped piece of camphor once or twice a month. Older people and young children can be swallowed with water and small children can anoint with potatoes or bananas as it is difficult to take it direct. You have to take it once a month. Garlic: People who eat garlic they can chew raw buds of garlic in every morning. It can be taken with warm water. Immunity increase by taking garlic. Lukewarm milk: Those who are not allergic to milk, they can take milk mixed with turmeric. Aloe vera: Aloe vera is easily available. It has thin and long leaves which have fragrance free gel. You can take this gel of one teaspoon with water. It is good for skin, joint pain and immunity. Neem: Neem has the property to clean the air. It is effective for airborne diseases and swine flu. You can chew 3-5 Neem leaves to clean the blood. Pranayama: For healthy throat and lungs you can do Pranayama and jogging. It is very beneficial for health and every ailment that are concerned with nose, throat and lungs. Vitamin C: Take citrus fruits and juices rich in vitamin C. It is not possible to get juice of amla every month you can take packed juice. Hygiene: You have to wash your hands every day with soap and washed with a hot water for 15-20 seconds. Especially before eating and after touching anything which you feel it has flu virus such as handle of bus, train etc. You must wash your hands.